Tag Archives for " paddling "
So sitting on your side with your arm out, put the ball under where your hip meets the ground - this is the top of the IT Band. Usually you want to roll out before your stretch out and with rolling you want to roll parallel to the fibres first and then perpendicular. So for the IT Band, you want to roll up and down first and then across. For how long you should roll, usually it’s until the discomfort is cut in half, so when you first lie on the ball it will be a bit tender and then it should go down in about in half and that’s when you can stop rolling. Next is going to be the Piriformis or the glutes. So this one is a little bit harder to find but you want to put keep the ball a little more to the outside of the glute and little bit towards the top. So basically find a tender spot or a hot spot and for this you want to roll side to side and then you’re going to roll up and down.Next is for your back, so you’re going to take two balls and put them side by side, one ball should be on each side of your spine. You can put both of the balls into a sock to keep them together to make it a little bit easier to roll. It’s hard to roll from the top to the bottom of your back so you want to roll a few times on your low back before moving it up and rolling again. You’re going to keep moving it up until you’ve gone from above your hips to the top of your shoulders. For paddlers, the middle and upper back are going to be super important. A lot of paddlers are really tight between their shoulder blades and we want to open up your upper back to really get a strong stroke. And remember that rolling and stretching should be done after you’ve already done a good on water cool down. As a hands down really different paddling isn’t really enough, you want to make sure you paddle for 5 to 10 minutes at 70%, good hands up paddling to really optimize your recovery and prevent injuries from happening. For the next stretch you’re going to lay on your back with your arms straight out and you’re going to bring one leg across your body. This is an upper back stretch but depending where you’re tight, you may feel it in your back, your chest or your glutes. Repeat this stretch on both sides. Next lie on your side and grab your top ankle with your top arm, you want to try and keep your core engaged so your lower back doesn’t arch. This is a quad stretch which is good to do on it’s own but you can also make it more of an IT band stretch by bringing your bottom foot up onto your top knee and pulling it towards the ground. You want to repeat this stretch again on both sides. The next stretch is for the hamstrings. You can do this with a partner or in a doorway. You’re going to lie flat on your back and put your ankle on your partners shoulder, have them bring your leg towards your body until you feel a strong but comfortable stretch. You can also put your heel onto a door frame and put your other leg, the one still on the ground through the doorway. This will allows you to bring your leg closer to your body by moving further into the doorway. On the right, you can see how people typically stretch their hamstrings and most of the time people arch through their back to try and increase the stretch which isn’t good for your low back. The stretch on the left keeps your back nice and neutral and tends to allow you to get a stronger stretch. This next one is a hip flexor stretch. So you’re going to go into a canoe pose and you want to feel this in the front of your hip on the knee that you’re kneeling on. This is going to be important to stretch for canoers to get that nice long reach. It’s also important for kayakers to stretch because you’re sitting in a boat all day and your hip flexors are getting really short and then you’re going to go into cross training and with running and cross country skiing and skating, you need long hip flexors to get that nice long push back and it’s going to reduce your risk of injury in the off season. Now you’re going to cross the front leg over and to the into Pigeon Pose. You should feel this in the glute of the front leg. A good cool down in stretching is really important because it’s going to decrease your muscle tightness, it’s going to remove the waste products that have built up throughout exercising, it’s going to reduce your risk of injury as well increase your rate of recovery. This means you’re going to be able to get more out of your next practise. So just like the warm up, not only is it going to improve your results because you’re not going to be injured, but it’s also going to be able to improve your results because you’re getting the most out of your training and the most of that next practise. This first stretch is for the lats so you’re going to start in a table top position and you’re going to sit back towards your heals. You want to keep your pinky fingers down and your thumbs up to increase the stretch. This stretch can be done on a ball like the girls are showing in the back, on the floor or on a high bench. When you move your hands to the left, you are going to increase the stretch on the right and move your hands to the right you are going to increase the stretch on the left. More most stretches, you want to hold them for 30 seconds to a minute and repeat them four to five times on each side. And then you’re going to go back into the table top position and you’re going to do a cat stretch. So you’re going to push up through your upper back and and feeling the stretch in-between your shoulder blades. A good cool down is going to include stretching as well as your on water cool down. Next is canoe - kayak specific rotates so you can do them with or without your paddle and with these you just want to stay nice and loose and follow the swing of a natural stroke. We’re ending with Burpees and jump squats. It’s good to end with something a little more explosive especially if you’re going out for a time control or a race. So again, it’s important to choose a warm up that works for you and includes your arms, legs and core. But remember that it is important to actually include a warm up that increases the blood flow to your active muscles, it’s going to reduce your risk of injury. Your muscles are going to contract faster and stronger making you faster in the race and in practise and it’s going to make you feel ready to participate especially after heats and semis being ready for the final. For kayakers and canoeists it’s important to do an on land warm up for your legs, arms and core before getting on the water. This is going to give you an example which is going to include all three, but it’s important to find what works for you. We’re starting off with just high lunges, feeling the stretch of the front of our back hip. Now we’re adding an arm raise on the opposite side of the front leg. It’s really important to warm up before practises, not just before races so your body is used to it on race day. And it’s also going to lower your risk of injury during practise and help you get the most out of practise. So you’re going to end up making bigger gains throughout your practise. Now we’re adding a rotation towards the front leg. Instead of doing full arm circles which can add stress to the front of the shoulders, we’re going to do arm swings in three different directions which our shoulders normally move in. So this first one is just across the front of your body; and the next one is going to be forwards and backwards, again not doing full arm circles, just staying in the front; and then the last one is out to the side, just staying in a comfortable range of motion. The next one is going to be rotations more for your upper back, so you’re going to go down onto one knee, kind of like a canoe pose and you’re going to put that front leg out to the side, put your arm down on the same side as the knee that you’re kneeling on and then you are rotating through your upper back. This one is good to get a little bit of separation from your upper back and your lower body and you’re going to want to do this on both sides. Dragon boating season is beginning in the lower Mainland as teams get out and train on the water for upcoming races. However, one of the key components integral to a team’s success in competition is building individual strength. A typical dragon boat stroke consists of a “catch” phase which targets the shoulders and arms and a “pull” phase which relies on strong back muscles. The following exercises can be included in your workout routine to develop a powerful dragon boat stroke. Strong shoulders, biceps, and triceps are needed to enter the water effectively while grabbing as much water as possible. Develop strength in these areas with dumbbell overhead presses, dumbbell shrugs, bicep curls, and bench presses. The latissimus dorsi is a large, triangular-shaped muscle located on the back that is crucial for a paddler to pull as much water as possible. Strengthen this muscle with overhead pull downs, seated rows, bent over rows, and pull-ups. Variation: Add weights to your pull-ups using a dumbbell between your feet, a belt and chain with added weight plates, or a weighted vest. Start by adding a very small weight such as 5 lbs and attempt to do 2 or 3 reps for 5 sets. 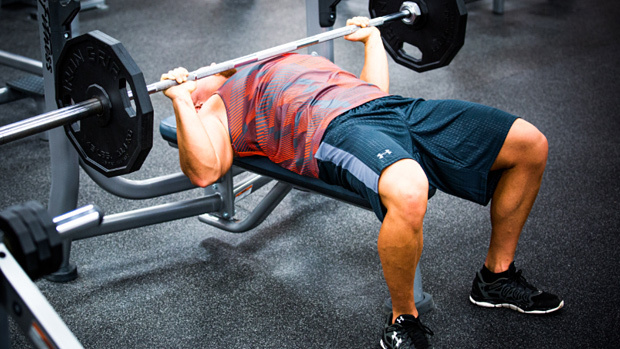 Increase your weight load during the following week by adding another 5 lbs and attempt to do 2 or 3 reps for 5 sets. Continue adding to your load as your strength improves.